Metal Gear Survive is Konami’s first game in the franchise following Metal Gear creator Hideo Kojima’s departure from the company. 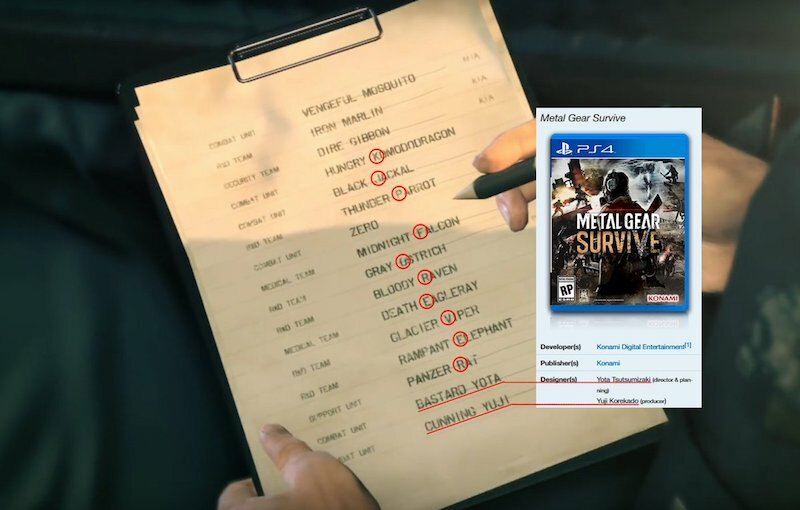 And while the overall reception for the game was mixed at best, considering how big a departure it was from past games and the controversy surrounding Kojima’s ouster from Konami, eagle-eyed fans on Reddit noticed a hidden message in one of Metal Gear Survive’s opening scenes. The game’s introduction contains a screen that has your character’s name on a roster. The names of the others on it form an anagram that reads “KJP FOREVER”. KJP is considered to be an acronym for Kojima Productions — the studio helmed by Kojima prior to him moving on from Konami. Hence the phrase could be a nod to the past efforts of Kojima and his team. Most likely it could have been added as a reference to the name of the wandering Motherbase side-mission recruits in Metal Gear Solid V: The Phantom Pain. Furthermore, the same screen has some not so pleasant terms for its producer and director. They’re a whole lot more obvious than the indirect praise for Kojima Productions. Hence they could have been purposely added as a self-deprecating joke. Nonetheless, it will be interesting to see how much of this was intentional or not, which will be obvious if Konami issue a patch to remove it. We found Metal Gear Survive to be a welcome entry to the franchise. It might lack the stealth-oriented fare of past titles but it’s entertaining enough to warrant your attention.